Whether you're a brand-new rabbit owner or already share your home with a herd of bunnies, you've probably noticed that pet stores tend to skimp on their selections of rabbit toys. Innovative play items for rabbits and other small mammals are often only given one shelf. In contrast, incredibly wide varieties of cat and dog toys dominate the aisles. Some people even believe pet rabbits don't need toys! This heartbreaking myth couldn't be further from the truth. Rabbits are intelligent creatures that enjoy active play and puzzle-solving. Providing your pet rabbit with a variety of toys is an essential requirement for being a great rabbit owner. 1. What Kinds of Toys Do Rabbits Need? The toys a rabbit needs differ greatly from toys designed for cats and dogs. Look at your pet rabbit: she has powerful hind legs, front teeth that never stop growing, eyes on the sides of her head instead of the front, and a sensitive nose. Cats and dogs are predators, but as prey animals, rabbits need a different type of environment to feel safe and enjoy life as pets. 2. Can I Make Rabbit Toys at Home? Yes; you can easily make some fine rabbit toys out of items around your house. A cardboard box makes a great hide-out for your rabbit. Your rabbit might enjoy pushing a paper towel roll around the room before chewing it to pieces. If you're 100% certain that your yard and trees aren't treated with pesticides, then dandelions and clover can be a fun treat. Branches from willow or fruit trees provide bark that's fun for rabbits to chew. Remember to check a list of rabbit-safe plants and trees before you feed your rabbit anything from outside. In addition to these easy-to-find items, there's one essential "toy" that all rabbits have to have: outside-the-cage playtime, preferably in a large open room such as your living room or rec room. Rabbits love running and jumping. Given the opportunity, a rabbit will run across or around a room at top speed, turning the entire room into a rabbit playpen. 3. Why Should I Buy Any Rabbit Toys If I Can Make Them Myself at Home? How would you have felt if you had to play with the same one or two toys for your entire childhood? Rabbits are intelligent creatures that need mental and physical stimulation. Did you know a rabbit can only see the colors blue and green? Did you know they can hear noises from over a mile away? Or that they mark their territory by rubbing a scent gland under their chin on objects they consider their own? Or that a very happy rabbit will sometime perform a "binkie," which is an impressive leap into the air that rivals the moves of an Olympic gymnast? Our point here is that rabbits need a variety of toys to address different needs. While a cardboard box holds lots of possibilities, your intelligent pet will soon exhaust those possibilities and be ready to move onto a new challenge. A mix of homemade and purchased rabbit toys will provide your rabbit with the stimulation he needs. 4. Can I Teach My Rabbit to Play Catch or Do Tricks? While some rabbits may be taught to do tricks or catch and retrieve a small ball, most rabbits will not be interested in these kinds of activities. The way rabbits play is very different from the way cats and dogs play. For example, while a rabbit might chase a ball that you roll across the carpet, he's more likely to enjoy gently bopping the ball with his nose. Some new rabbit owners get upset when they buy a wooden or rope toy for their pet, only to find the entire toy destroyed in a matter of days. Instead of getting upset when a rabbit tears apart a new toy, feel flattered! Rabbits play with wood, sisal rope, cardboard, and paper (and your carpet!) by chewing it up. The faster new rabbit toys turn into a pile of splinters, the more fun your pet had playing with them. Consequently, you may want to mix in toys that take longer to shred. We reviewed the following rabbit toys based on their features and through a pro-and-con breakdown for each. We paid special attention to safety issues and the ways the toy addressed a rabbit's unique needs. The toys we review here range in price from as low as $ to up to $$, depending on their style, complexity, design, and where you choose to purchase your pet supplies. 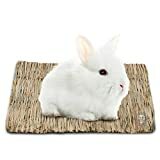 This rabbit toy is a wooden platform approximately one foot high with sisal ropes and wood blocks attached. The rabbit can hide beneath the platform and play with hanging toys or leap up onto the top of the platform to play. 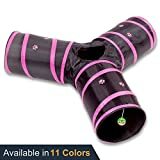 This toy addresses a rabbit's desire for a hideout, and it also offers plenty of chewing options. The original and best! A fun chew and scratch toy. Made from pet safe materials including seagrass and corn leaf. Ideal for rabbits, guinea pigs, chinchillas and rats. This rabbit toy is a 100% seagrass-made tree with hanging carrot toys for a bunny to reach and grab. The seagrass addresses a rabbit's need to chew while the hanging carrots encourage physical activity and problem-solving. This unusual, logistical rabbit toy allows you to hide treats for your rabbit to find by flipping open small compartments. It addresses your rabbit's need for intellectual stimulation. These woven grass balls are sold in two-packs, along with a palm-sized grass mat. They address a rabbit's need to stay active as well as its need to chew. 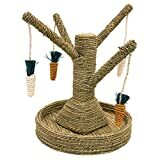 This "tree" provides a wide selection of hanging rabbit toys on a wooden stand. The hanging toys are great for bopping and chewing with components such as sisal rope and colorful blocks. They address a rabbit's needs for physical activity and chewing. 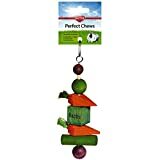 A dual-purpose toy that provides a comfortable, chewable resting surface when placed over a rabbit cage's wire floor. This addresses your pet's chewing requirements as well as giving him a soft spot for relaxing in his cage. 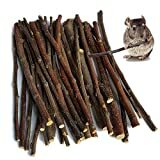 Gauge: About 100g (Apple Tree Sticks Are Thick Or Thin, The Number Is Not Sure) Each Package ,6 Inch Long Each Stick. These sticks designed to fulfill your rabbit's chewing needs are gathered from trees on an organic apple farm. They are sold by weight rather than the number of sticks. This hanging bed is a soft, cozy cave with a cartoonish face design. It measures 8-1/2" by 10" with a 7" height and 3" door. It addresses your pet's desire for a safe hideout. These multi-colored, block-and-sisal rope rabbit toys are designed to hang in a rabbit's cage. They can be attached to the cage's ceiling or wall. They encourage physical activity such as bopping and batting the hanging toy, and they also provide chewing opportunities. This cat tunnel is very popular with some rabbit owners. It provides three entrances leading to a single rooftop hole and includes a hanging bell toy. It measures approximately 3' long and 10" high. It addresses a rabbit's need for a safe hideaway. Our reviewers examined quite large a number of rabbit toys. Some toys addressed a rabbit's need to chew; others encouraged active play, and a few provided cozy environments for exploring and relaxing. Out of the ten toys we selected for our list, two stood out from the rest. The first is "The Tree." What we liked about this toy is the way that rabbits adapted it to their own preferences. Even though the toy is designed with an upright stand, some reviewers noted that their rabbits had a lot of fun knocking it over and dragging it around. Combined with its variety of chewable materials, this toy struck us as being worth the $$ investment. Our second favorite toy was (surprise!) one actually designed for cats. The Prosper Pet Tunnel's 3-way shape and ample size address a rabbit's natural instinct to burrow. Paired together, these toys are sure to keep your rabbit happy! Your style is really unique compared tto other folks I’ve read stuff from.